Roo's 5th birthday is coming up in March and this year I am trying to be more proactive in party planning. I think she wants to have her party at the gymnastics center, like several of her friends have this past year. It's really great- they run the kids ragged so they sit almost immobile while you do cake and presents! One of the things that I fret over most is making goodie bags. It's not that I'm a particularly competitive mom, I just don't want to overdo the cheapo candy and junky toys. Luckily, I've found the perfect solution for this year: MY M&M's. Who doesn't love these ubiquitous chocolate candies? M&M's are a staple of childhood and family entertaining. They melt in your mouth, not in your hands, don't ya know? I'd wager most of you reading this have had some over the holidays, either at a movie theater or as a holiday snack in someone's home. 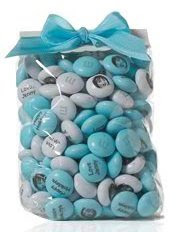 MY M&M's lets you create your own personalized M&M's: choose your favorite colors (with 22 shades available, you're not limited to the traditional palette! ), a message, even add your own photos or graphics to make the perfect party favor or special gift. There's even a Martha Stewart collaboration with MY M&M's that features crafty tutorials for elegant gifts. The Snack Bags would be perfect for Roo's birthday, although I'm thinking lilac and fuschia might be better colors for her. Thanks to Mom Central for introducing me to MY M&M's! My mom ordered some of these for my baby shower and everyone loved them. They said Soren on them (unbeknownst to me, she ordered them, and we hadn't even agreed on the baby's name yet). I think Roo's crowd will love them too. I think it is a brilliant idea! I wanted to order them for my in-laws 50th Wedding Anniversary, but since it was only 2 days after Christmas I figured we had all consumed enough chocolate. I am thinking of doing this for my DH for Valentine's Day. How fun! I love that you can do pictures! Oh...Little Roo will be in choco-land heaven, won't she? They have these great boxes at the container store, clear or colored plastic to put them in. I also love giving arty things as favors, a marker and a little spiral book so kids draw or write or they can sign each others. Not expensive. Also those compact towels that you put in the water and they open to a wash cloth are genius. WOW! how fantastic. to be honest when I think about party bags I feel a bit freaked out...managing the expectations/pressure seems full on. I think you are onto a winner with these!! I also wanted to say thanks so much for visiting my blog recently and for your supportive and encouraging comments. I've really apprecaited it!